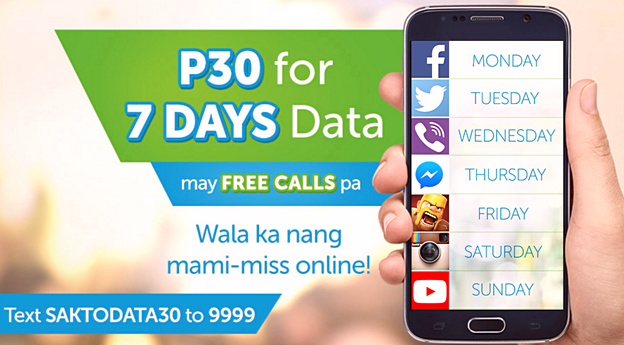 Aside from beefing up its Big Bytes offerings, Smart Prepaid has recently launched a new 'whole week' data promo that's perfect for budget-conscious subscribers including students and young professionals who want to always have access to the internet on their smartphones anywhere they go. Giving users 200MB of mobile data allocation that's good for seven (7) days plus 20 minutes of calls to Smart, Talk N' Text, and Sun Cellular numbers, Smart Sakto Data 30 is clearly one of the best value for money promos that the MVP-company has ever come up with! So what can you do with 200MB of data, you ask? Well, according to Smart, that's good enough for posting more or less 200 Facebook status updates (with one photo attachment weighing less than 1MB -- and you'll be able to post more entries if they don't include images), 42 minutes of non-HD Youtube streaming, sending 1,400 Viber messages, posting at least 300 Tweets, and reading 154 web pages or blogs with photos. I believe that's also enough to cover more than 50 Instagram posts. And of course, the 20 minutes TRI-net calls add-on should come in handy for subscribers who have loved ones, friends, and business partners on those networks whom they need to get in touch with regularly. I know it's hard to believe that Smart is now giving us all that for just Php 30 -- but believe it. To subscribe, just make sure you have enough load to cover the promo and then, text SaktoData30 to 9999. As more and more mobile consumers are upgrading from their current feature phones to more powerful full-touchscreen smartphones that allow them to be online on-the-go, Smart Communications is becoming more aggressive in attracting them with data promos that definitely give the most bang for the buck.